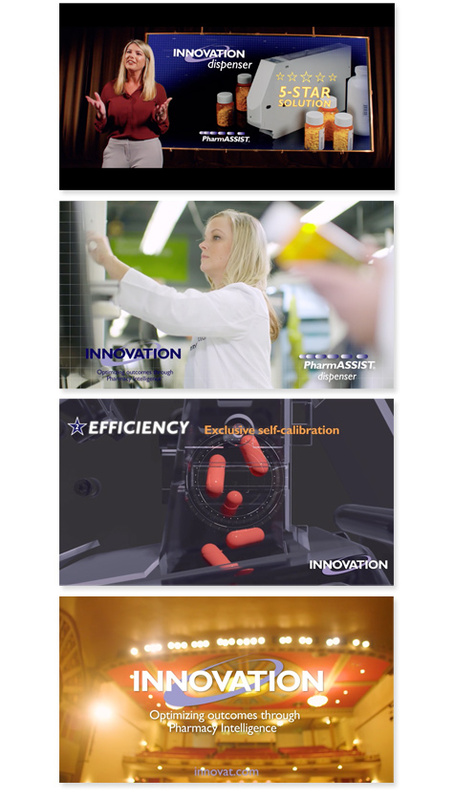 Innovation Associates called in Novel Studios and amberSands Creative to significantly upgrade videos showcasing their premier pharmaceutical fulfillment solutions. We took it "to the stage," in a series of industrial videos that brought a dramatic presentation to these truly 'innovative' products. The client said, "Truly a new chapter in Innovation PharmASSIST marketing, training, and product evangelism. Awesome! Great work, amazing outcome!" This video centered on their proprietary "dispenser" platform. Innovation Associates called in Novel Studios and amberSands Creative to significantly upgrade videos showcasing their premier pharmaceutical fulfillment solutions. We took it "to the stage," renting out Binghamton, NY’s “Forum” performing arts venue, hiring top talent, and creating a series of industrial videos (featuring Novel Studio’s outstanding motion graphics) that brought a dramatic presentation to these truly 'innovative' products. amberSands Creative provided concept creation, scripting, and on-site direction. The client said, "Truly a new chapter in Innovation PharmASSIST marketing, training, and product evangelism. Awesome! Great work, amazing outcome!" This video centered on their proprietary "dispenser" platform.